I very recently became interested in aquaponics and am starting my first setup. I don't have a lot of space or money, so I bout a 20 gallon tank. I've been looking at goldfish but I keep finding conflicting information about how many I should have in a system this big. I also keep seeing that my volume of growbed should be the same as the tank, but the biggest I can find that isn't way too big is 15 gallons. Is this an issue? Any suggestions would be greatly appreciated! the volume of the grow-bed isn't an issue. In aquaponics, and in recirculating aquaculture in general, the important ratio is fish bio-mass to wet media volume (or rather protein input via feed : bio-media surface area). General rule of thumb in AP is 20 liters of gravel/other media per table sized fish. So I think 15 gallons for the grow bed is more than enough. You could have 4/5 goldfish perhaps, I wouldn't have many more in that sized tank, as they grow fast and will become cramped. Thanks for the info. And ya I know it won’t make that much but I’m leaving for college in about 6 months so I don’t want to make anything too big until I have my own place. I'm also waiting to get my own place and set up a proper system. Been waiting 2 years already and will have to wait another 1 and a half at least! I started my system 14 months ago with a 20-gallon aquarium, 25 liters of Hydroton clay pebbles, and 2 fantail goldfish that weighed less than ¼ ounce combined. 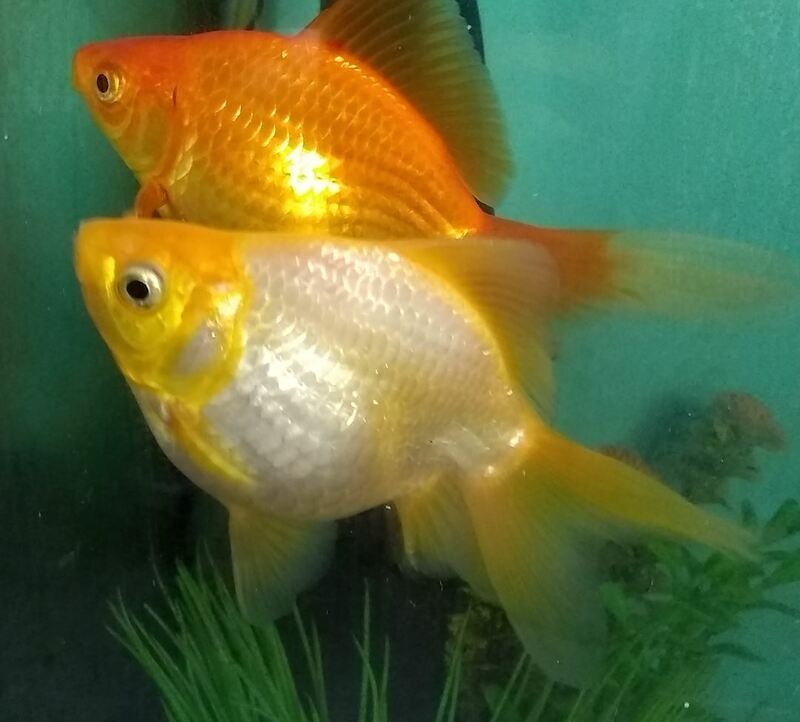 Now the goldfish weigh about 6 ounces and have become well-loved pets with surprisingly endearing personalities. I grow most all the herbs one old man can eat and need to add tomato and pepper buckets to the little system. Although there is no intention of adding fish, I increased the fish tank to 29-gallon for added swimming space and well-being of Sara and Maybelle. My personal attitude has become that aquaponic stocking rate guidelines have very little to do with raising pet fish that you hope to live out their natural lives of maybe 15 years or so. A consequence of having a relatively small growbed, by AP standards, is that after about 6 months of fish growth, despite a lot of plants in such a small bed the system couldn't keep nitrates under control which would have poisoned the fish so weekly water changes became necessary. I've been looking at goldfish but I keep finding conflicting information about how many I should have in a system this big. I suggest you avoid common and other single tail goldfish varieties. They have longer bodies, swim much faster, and need more space than their "Fancy" cousins. When I was studying the question a year and a half ago I decided on Fantails because they seemed to be the least altered of the fancy varieties. Telescoping eyes and big wrens just look like deformities to me although I'd catch heck for saying so in a goldfish forum. After a year though one of my fantails turned out to be a ryukin which are similar to fantails. I have found it helpful to maintain active participation both with this forum and one for goldfish keepers, a foot in two different worlds if you will. Are you taking your aquaponic system with you to college in six months. If not, is there a caretaker at home to maintain it? After talking about Sara and Maybelle so much, of course I've got to include a picture. Good luck in aquaponics and in college. Thank you for your suggestions. And thanks for the picture! Those do look like some big healthy fish. To answer your question, I would love to take it to college, but I’m not sure if I’ll be allowed. My cousin has a goldfish pond in his backyard though so if all else fail, I’m planning on letting them live there. Can someone give me the process of a fishless cycle? Should I have plants growing while I do it? Most sources say no but then how do the nitrates get removed? Any help would be appreciated. 1. Buy an API Freshwater Test Kit and test your tap water. It will be useful information to have and you will get used to doing the five different tests. Second 1. Before you start cycling, set up your fish tank, pump, growbed with media, media guard, standpipe, and plumbing between the two. A bell siphon isn't necessary and can be added later provided the media guard is big enough, but if you want a drain and flood set-up, why not include it from the beginning? Third 1. Assuming you've never done this before, start a thread in the Members Section of this forum and solicit input from experienced members first. Having said all that, here are a couple of links to threads in this forum. And here are a couple of links from elsewhere. Edited to add: And then I remembered your mentions of a 20-gallon fish tank and a 15-gallon growbed. Under those circumstances, if you go with flood a drain, you are probably going to want a sump tank. The sump tank doesn't have to be installed before cycling but it is something you would want to be aware of. If you went with a constant flood there would be no need for sump or bell siphon. Those sources don't have any idea obviously. Seedlings can go in from day one, that way they are established and removing Nitrates as they show up, as you've suggested. Only plant small leafy greens, ie: Lettuce, Asian greens, herbs etc, for the first few months, until the system builds up a decent nutrient bank. - Use Seasol Powerfeed, or Maxicrop in the US, as your Ammonia source. It will feed the seedlings as well. - Add three or four capfuls per 500L of water initially. - Test the Amm level the following day, 1ppm to 2ppm is perfect for cycling, more won't make it cycle any faster. - If it is hasn't gotten up into that range, keep adding a capful or two per 500L every day until it is. - Once it is, stop adding the Amm source, keep testing Amm and now Nitrite as well, every day. - The Amm should stay the same for 2 or 3 weeks then start to drop, when it does you'll get a Nitrite spike, which can be over in a day, or take 3 or 4 days, depending on conditions. - Once both the Amm and Nitrite have dropped to 0.0ppm, the system is cycled. - If you don't have the fingerlings to go in at this point, simply add a capful or two of the Amm source every 3 or 4 days, to keep the bacteria colony and plants happy until you get the fingerlings in.